Use this Acid Testing Kit to test the acid level of your must, then adjust accordingly. This kit comes complete with test vial, syringe, color solution, sodium hydroxide and detailed instructions. 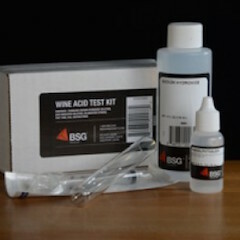 How to use a Acid Test Kit: Acid testing kits can help you know how much acid you are dealing with in your wine. Specifically, this kit is testing for tartaric acid. By testing the acid level in your wine, you are able to adjust it as you need to, but you can only adjust the wine so much before you end up with a chalky flavor in your wine. Be aware that these kits are only able to test acid up to 1. Anything above that and the reading will be inaccurate. Unfortunately, the hot, dry summers in the past few years have caused the acid levels to rise significantly. A lot of schools test wine grapes and might be able to tell you what the level of acid is for you area. You may need test the wine at several stages of the process, starting with just before you pitch the yeast. How often you test will depend on the type of wine you are making (for example, you want to take a reading after a malo-lactic fermentation if you are performing one) and personal preference. Again, you are only able to adjust so much, so your wine may end up with a bite to it because of the poor growing conditions. 1) Using the plastic syringe, measure 15cc of wine or juice into the test cup. Be sure to sanitize the syringe if you are drawing a sample directly from your fermenter. Red wine samples may be measured into a larger clear glass vessel and sufficient distilled water added to thesample to dilute the color to a rose. 2) Add three (3) drops of Phenolphthalein Color Solution (the smaller bottle that comes in the kit) to the test sample. 3) Wash out the syringe and draw in 10cc Sodium Hydroxide neutralizer (the larger bottle that comes in the kit). 4) Add the Sodium Hydroxide a few drops at a time to the wine or juice sample. As the neutralizer is being added to the sample of wine or juice, agitate the cup until a slight color change is noted and remains.Continue adding the Sodium Hydroxide a drop at a time, agitating the cup with each addition, until a deep, dark color change is noted and an additional drop of neutralizer does not effect the darker color. This indicates the end point has been reached. 5) Note the amount of Sodium Hydroxide left in the syringe when you have reached the end point. You need to know how much was used (10cc minus what is left in the syringe) to obtain your reading in the next step. White wines will change to pink/red, red wine will change to a blue/grey/black. Each 1cc of Sodium Hydroxide neutralizer required to attain the color change indicates 0.1 of acid expressed as Tartaric. For example, if 5ccs of neutralizer is needed to attain the end point color change, then the acid level is 0.5. Make certain that the Sodium Hydroxide and Phenolphthalein bottles are always kept tightly capped when not in use because both solutions will deteriorate through exposure to air. Wash and dry syringe and test cup after each use. 1 teaspoon of Acid Blend will raise the acid level of 1 U.S. gallon of must by 0.15. 1/3 oz. (9.5 g) Acid Blend to 1 gallon of must raises the acid level by 0.3. Do not reduce acidity by more than 0.3 to 0.4 because your wine will end up with a chalky taste to it. You are better off leaving the wine a little acidic then using a lot of calcium carbonate to reduce the acid. Listed below are the ideal acid levels for most types of wines. The acid testing kit comes with everything you need to take several tests a year. Taking a test at the beginning, before you pitch the yeast, is a good habit to get into, because it is better to make adjustments before the fermentation than later on in the process. You can make adjustments all the way up to bottling time, however your adjustments will not be as beneficial as if you had done them earlier in the process.